Tamales are still one of my favorite Mexican items and a treat I don’t get to indulge in as often as I would like. 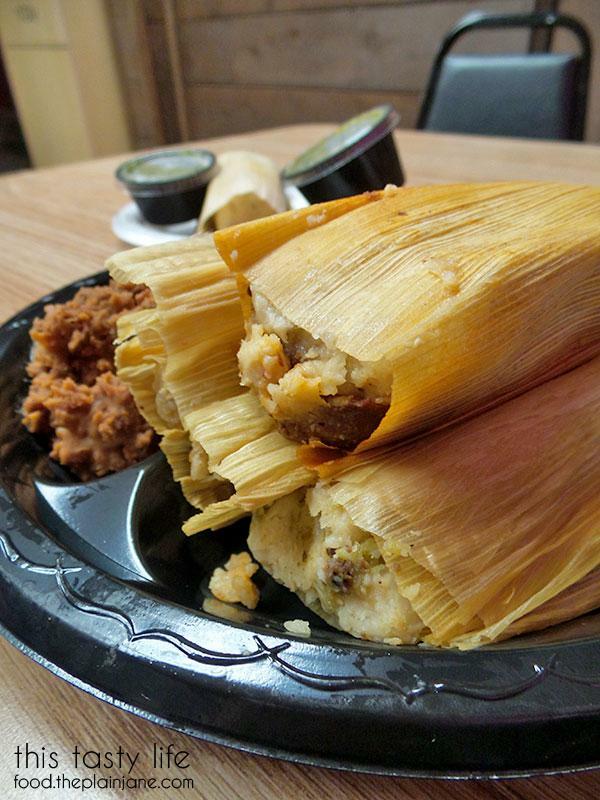 A lot of taco shops or Mexican restaurants have tamales on the menu, but they quickly run out of tamales. 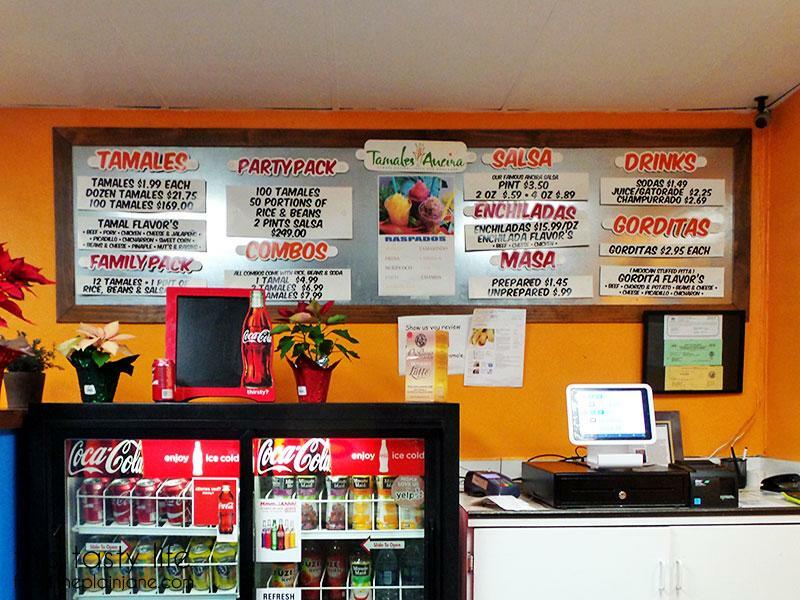 There are a few dedicated shops in town whose menu mostly consists of tamales and this is the one of those shops. 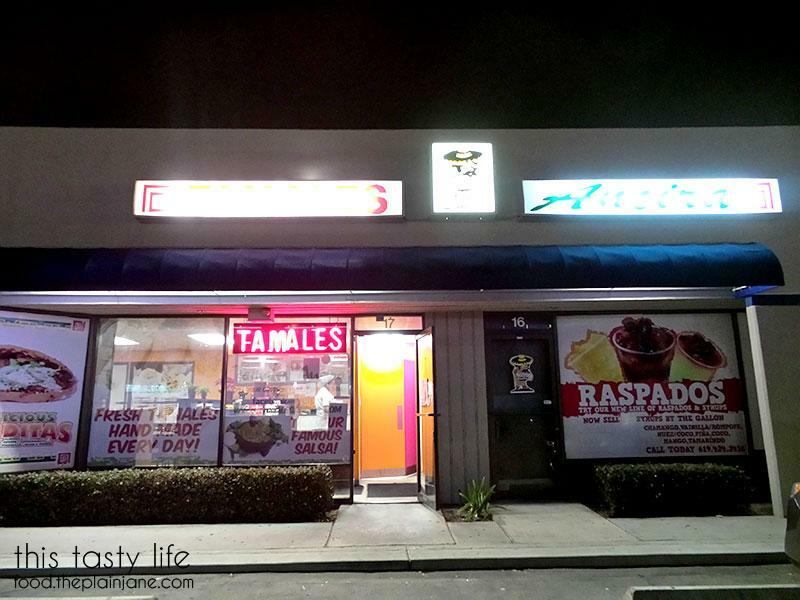 Let’s check out Tamales Ancira! I promise it does say “Tamales Ancira” on the outside where that blurred white light is. Apparently I forgot to change the settings on my camera (bad blogger). We’ve been here three times now, hoping to try the Gorditas in addition to a plateful of tamales but we’ve struck out every time. It wasn’t until the third time we got a true explanation as to why. That first time the lady working told us to come any day of the week after 5PM. The second time a different the lady tried to explain it to us in Spanish and we didn’t understand (after speaking in English first) and the third time we were told the person who makes the gorditas only makes them Monday through Friday so they often run out of them by the time the weekend comes around. If the stars, suns, and moons ever align, maybe we’ll get to try the Gorditas someday. As it is, we’ve only tried the tamales. The tamales are all hand made, which is impressive when you get a peek at how many tamales are just up front sitting in the warmers. Their available flavors are: beef, pork, chicken, cheese & jalapeño, picadillo, chicharron, sweet corn, beans & cheese, pineapple, and nuts & raisins. Single tamales are $1.99 each, 1 dozen for $21.75, or 100 tamales for $169. They also have combo plates which comes with rice, beans and a soda. 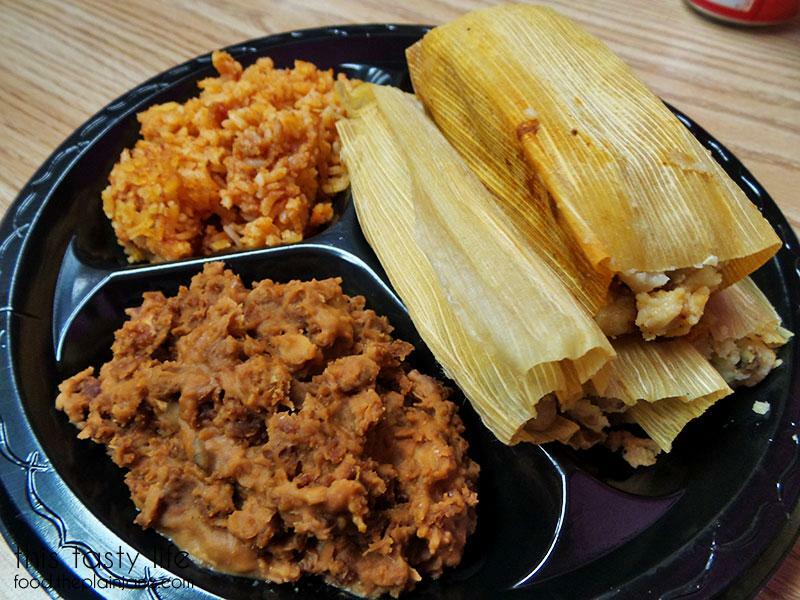 The 1 tamal combination plate is $4.99, 2 is $6.99 and 3 is $7.99. They do have tables available inside if you want to eat your food there. There’s a TV in here usually showing a soccer match broadcast in Spanish. On that first visit, Jake, S and I shared a 3 combination plate. The rice is nothing really to write home about – it’s Spanish rice, one of my least favorite kinds of rice. It tasted fine for what it was. Jake enjoys the beans here and I think they’re not too bad. I’ll actually eat some of them, which is pretty rare for me. You can see chunks of the whole beans in there. 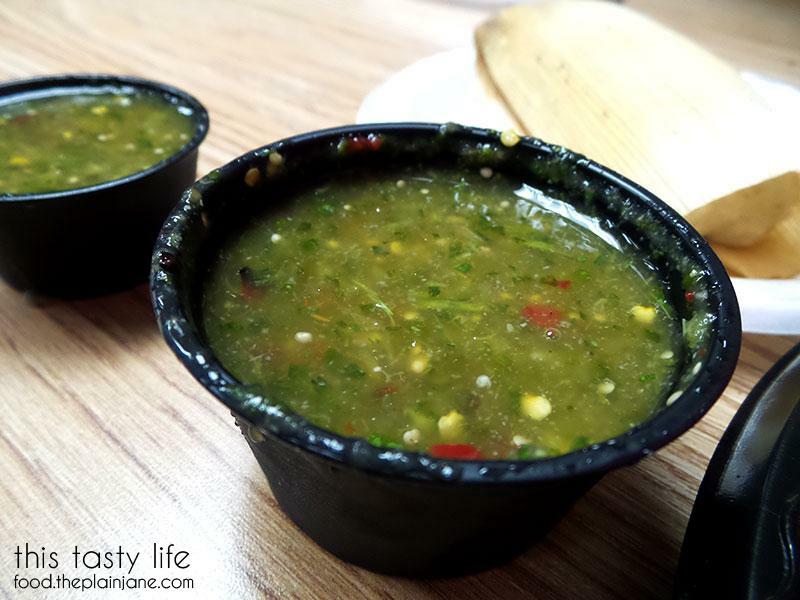 They also have their own homemade salsa which is this bright green concoction. 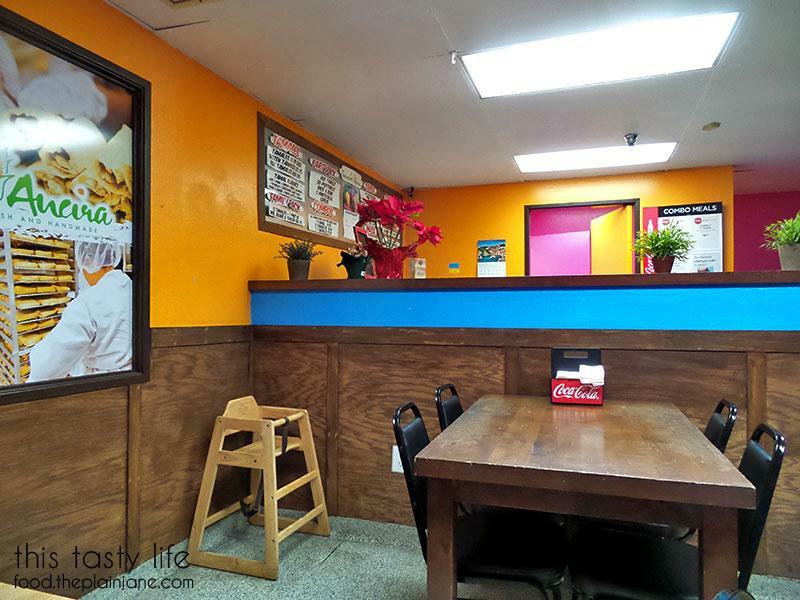 If you peek at their reviews on Yelp, most people really rave about how good the salsa is. It has a real punch of flavor and it is also spicy. I don’t personally like eating my tamales with anything on them (except an extra little sprinkle of salt) so I don’t use their salsa. On our initial visit, we tried the (left) cheese & jalapeño, the pork and the picadillo. Of the three, the picadillo was my favorite one. The picadillo filling was ground beef mixed with peas and carrots – almost like what you’ve find at the bottom of a shephard’s pie. It was well seasoned and one of the milder fillings. The pork was also very good though much spicier than the picadillo. It had plenty of filling inside the moist masa. The beef and pork look quite similar and have a similar marinade/spice and both are very good. The cheese & jalapeño is not as spicy as I thought it would be as long as you don’t eat the jalapeño! There doesn’t seem to ever be enough cheese though (we’ve got that one more than once). The cheese is always on just one half of the tamale for some reason. The undocumented flavors I’ve also tried are: the chicken (mild and very tasty & moist) and the sweet corn (more of a dessert tamale, it is much sweeter and has bits of corn in it). Jake says we tried the chicharron but don’t remember it and Jake and T tried the beans & cheese and liked that one (but they felt it needed more beans and the filling was a little lacking). We haven’t tried the pineapple or the nuts & raisins and I doubt we will anytime soon. I think raisins are gross and hot pineapple forces me to make a weird “I-don’t-like-this” face. 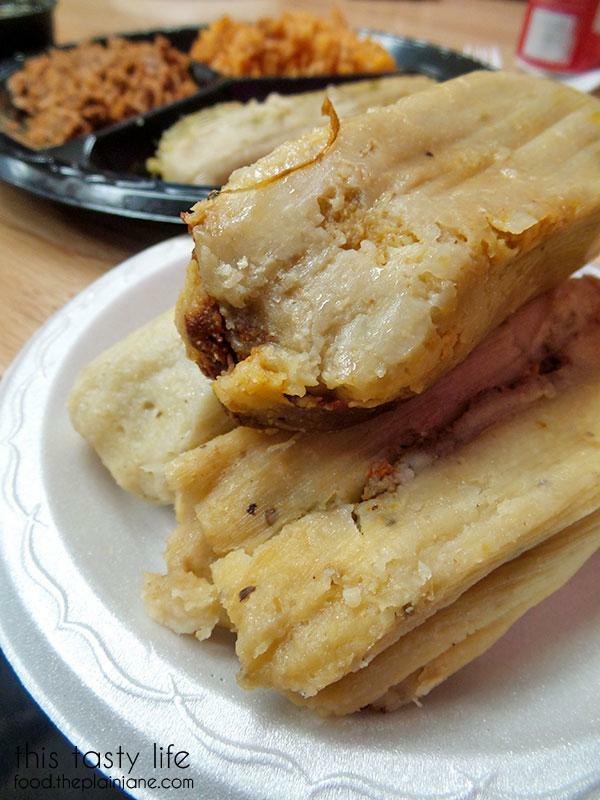 What I like the most about the tamales at Tamales Ancira is the masa. It’s moist and almost “tender”. It pulls away as soon as you run a fork through it and doesn’t crumble apart. It’s smooth and well seasoned and very delicious! They have a good number of flavors to appeal to many folks and you’re sure to find a favorite. When you decide to go (come on now, you’re gonna go, aren’t you? ), I recommend NOT going on Sunday since they tend to run out of flavors and other items (like rice). I don’t think my tamale hunt is over (or will ever be over) but I really like the ones here. Got any other tamale recommendations for me? I’m a tamale monster! Please let me know in the comments below! Hi J.S. – Dude. Salt! It’s so magical! Tamales usually never have enough salt for my liking and that little extra pinch always makes me love them more (especially good salt, like Maldon or a fleur de sel – mmmm). I don’t like how salsa seems to take away from the flavor of the masa/tamale itself so that’s why I don’t use it. More salt, plz! Hi Lynn – I know, I wanted to go to the tamale party… I think I was out of town? Gosh, I don’t remember why now. 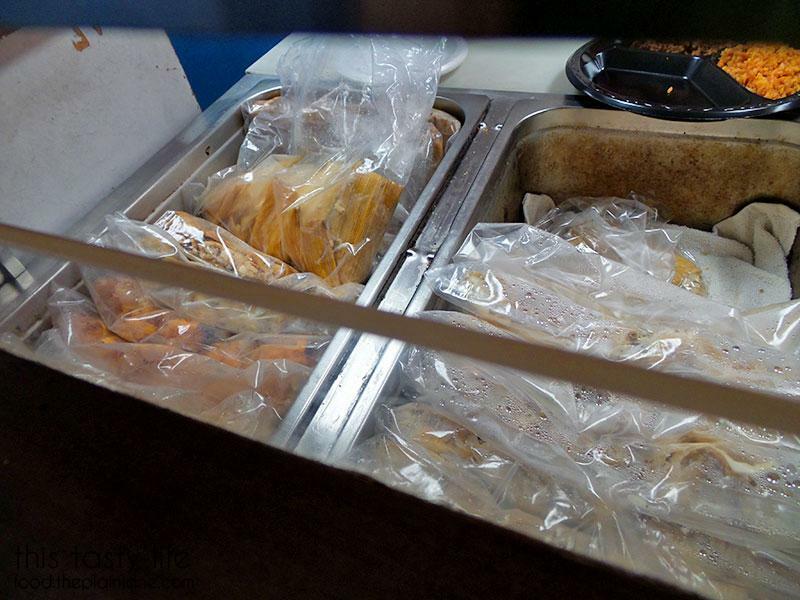 They prepared masa at Tamales Ancira, too, which might encourage me to try and make my own tamales instead (someday). If a tamale is dry I probably won’t finish eating it! I’ve never been a fan of tamales BUT I like what’s INSIDE em though. Like I’ll eat the filling but not the mashed corn part. Is that weird. 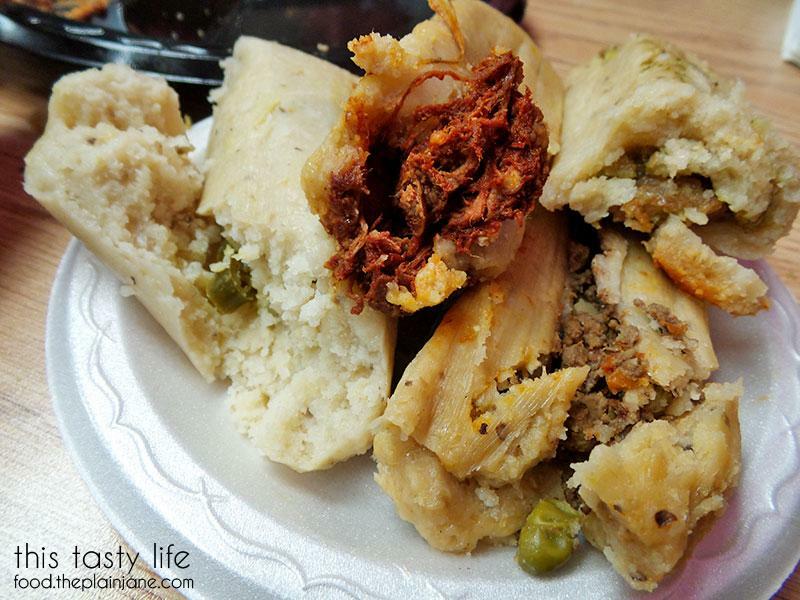 Have you tried to make tamales before? It always looks interesting when I see them being made. I wonder what’s a tougher chore: wrapping dumplings/lumpia or making tamales. I LOVE the masa, just like I LOVE cornbread and other corn related products! I have never tried to make them before. The masa part always intimidated me a little. They have prepared masa here though, I feel like I should just make my own filling and DOT IT. I feel like lumpia would still be tougher since you have to wrap them really tight, where these you just wrap them in dried husks. Looks like their price has gone up from $1.69 (2011 price). It helps to have Mexican friends, haha. Seriously. At Christmas time which is tamale season. Otherwise, I’ve bought them from Mexican markets or even at a few panaderias.